The $400 (as of May 22, 2012) Brother MFC-9125CN stands out among other low-cost color laser multifunction printers for having decent speed and toner costs. Though this MFP is unremarkable otherwise, it's a legitimate option for a small office seeking an inexpensive print/copy/scan/fax machine. The MFC-9125CN's engine uses an LED array instead of the more traditional laser, and the MFP comes with 64MB of RAM, expandable to 576MB total. While its monthly duty cycle is a midrange 25,000 pages, the more realistic print volume (per Brother) is 300 to1500 pages per month--a low to moderate figure for a small office. Installation was easy via either ethernet or USB connection. (If you're looking for wireless in this price range, the Canon ImageClass MF8080Cw, the Dell 1355cnw, and the HP LaserJet Pro 100 Color MFP M175nw all have it; but the Canon is very slow, and the Dell and the HP have pricey toner.) Brother bundles Scansoft PaperPort 11SE with OCR for Windows users, and Presto PageManager 9 for Mac users. The control panel has a straightforward layout, with a two-line, monochrome LCD for navigating menu items. The MFC-9125CN should cover a small office's paper-handling needs. It comes with a single 250-sheet input tray (no add-on options available) and a 100-sheet output tray. There is no automatic duplexing--a common deficiency in this unit's price range--but manual duplexing help is available through the driver. A 35-page automatic document feeder (ADF) allows scanning of multipage documents; Brother also supplies a letter/A4-size scanner platen. The MFC-9125CN's midrange speeds were middling or better in comparison to the average speeds posted by other machines we've tested. It printed simple documents, consisting mostly of black text with a few small, grayscale graphics, at a rate of 12.2 pages per minute on the PC and 12.5 ppm on the Mac. Photos printed a little quicker than average, at 2.7 ppm for snapshot-size photos on the PC, and 1.3 ppm for a full-page photo on the Mac. A PDF file printed at 7.9 ppm compared to a category average of 4.8 ppm. Scans and copies were also pretty fast. Print quality was typical of output from a low-end color laser: We had no complaints about text pages, but we found the MFP's color quality somewhat disappointing. Colors tended to look yellowish and grainy, whether the object was a simple color block or a piece of fruit. Fleshtones looked especially unnatural. Areas of shadow got dark too quickly, giving images an unduly murky look. Scans of photographs suffered from similar problems, but scans and copies of text and simpler graphics were pretty good overall. 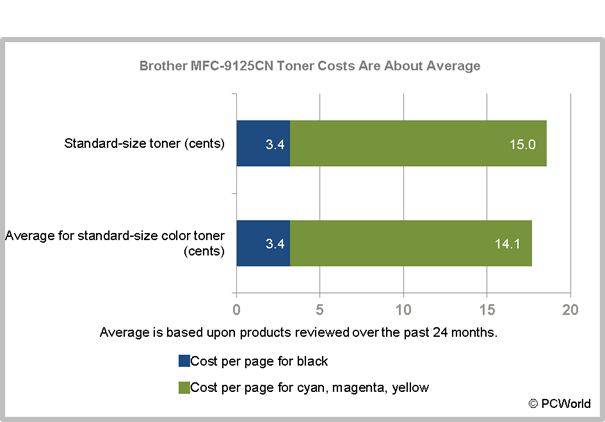 Low-cost color lasers tend to have high-cost toner, but the MFC-9125CN's consumables are reasonably priced. The model ships with starter-size cyan, magenta, yellow, and black supplies that last for 1000 pages apiece. (The separate drum lasts 15,000 pages.) The replacement black costs $75 and lasts for 2200 pages (3.4 cents per page). Each color costs $70 and lasts for 1400 pages (5 cents per color, per page)--a little more expensive than average. A page using all four colors costs 18.4 cents. The cartridge bays are not keyed to ensure that you put the correct color in the correct bay, and the printer will use whichever color you install as the color it thinks it is. For this reason, a misplaced cartridge can produce odd-looking images. We have observed and tried this on other Brother printers. The good news is that we've been able to return the cartridges to their rightful places and print correctly without further incident. All color laser/LED multifunction printers priced below $500 have some shortcoming; that's how they manage to be so affordable. The Brother MFC-9125CN's grainy image quality and lack of automatic duplexing are typical (though disappointing) drawbacks, but it shows well against its competition in speed and toner costs. Compared to other low-cost models, the MFC-9125CN stands out for having reasonably good speed and toner costs--but color quality is mediocre.